One of my favorite Sunday night dinners is Surf and Turf on the grill. 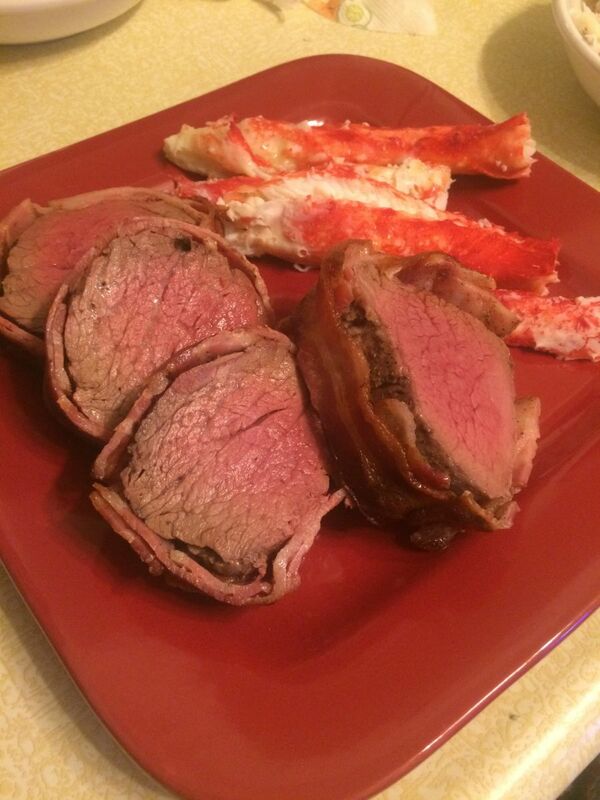 You can really impress your friends and family with beef tenderloin and crab legs, and the best part is, it’s simple. As long as you know your timing and temperature and you have your Weber, you’re good to go! First you will need to pre-heat your grill. I grilled both the tenderloin and crab legs on a Weber Performer Charcoal Grill. After the grill has pre-heated for 15 minutes, on high, you will want to to set it up for indirect, medium grilling (350-450). Indirect grilling is as simple as it sounds, there is no heat source directly under the food that you are grilling. For charcoal, I use the Weber Char-Baskets and place one on each side, leaving the middle zone open for indirect grilling. If you are using a gas grill, after pre-heating, turn off the middle burner for indirect grilling. Next, you will want to prep your beef tenderloin. First you will season the tenderloin with salt and pepper. 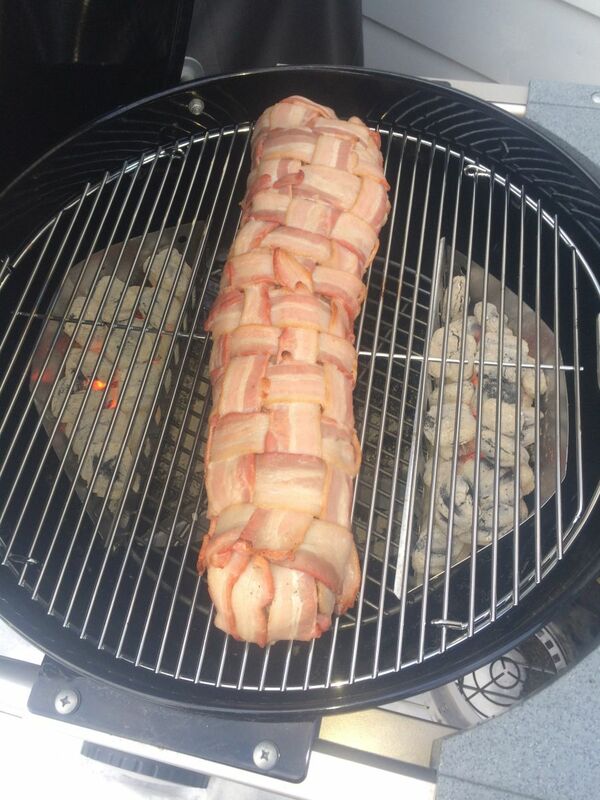 Today, I did a bacon wrapped tenderloin, well because, bacon makes everything better. You will need about a pound and a half of bacon for a 3-pound tenderloin. On a sheet of aluminum foil you will weave the raw bacon into a rectangular shape. You want it to be the length of the tenderloin and wide enough to wrap around. After you fully wrap the tenderloin in bacon, I recommend putting it in the refrigerator for about 15 minutes. This will allow the bacon to hold onto the tenderloin when you transfer it to the grill. Next, we will be grilling the tenderloin at a medium heat, between 350-450. To adjust the temperature of a kettle charcoal grill, close the top damper about halfway and for gas turn the infinite control knobs down. The tenderloin will take around 45 minutes at a medium indirect heat to cook. Make sure you’re checking the internal temperature of the tenderloin at the 30-minute mark with an instant read thermometer, which will ensure you do not over cook it. Remember you can always cook it more, but you can never go back. Check out our guide on internal temps here. After the tenderloin is grilled to your desired internal temperature, take off and let rest for about 10 minutes. Letting your meat rest is important because it allows the meat to relax and pushes the juices back into the meat, which is where a lot of the flavor comes from. During the resting period, the tenderloin will come up an additional 5 to 10 degrees internally, so keep that in mind when planning what temperature you would like it grilled to. 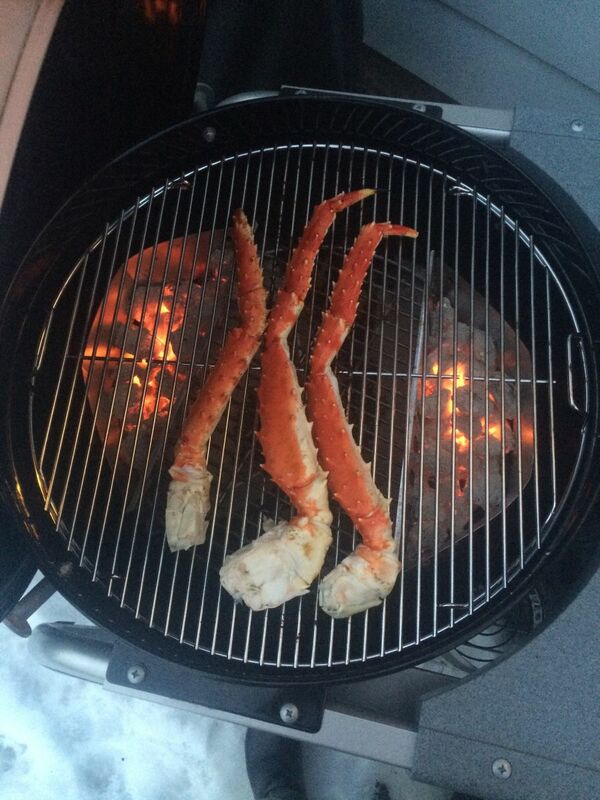 While the tenderloin is resting, this is a perfect opportunity to grill your crab legs. You will be grilling them at a low-heat, indirectly, for about 10 minutes. At this point my charcoal grill had dropped to a low heat of 310 degrees, which is perfect for placing the crab legs over indirect heat. The majority of time, King Crab Legs bought from the store are already cooked and then quickly frozen to secure the taste. Its important to let them first thaw in the fridge and then its just a matter of re-heating for a couple of minutes on the grill (4-8 minutes depending on size). Raw legs also only take a couple minutes and the outer shell will turn a rosy red color when done! After the crab legs are grilled, what I like to do is take the meat out of the shell for my guests, and pour hot butter over the top of the crabmeat. A nice glass of red wine to pair and you have yourself an amazing surf and turf grilled meal!